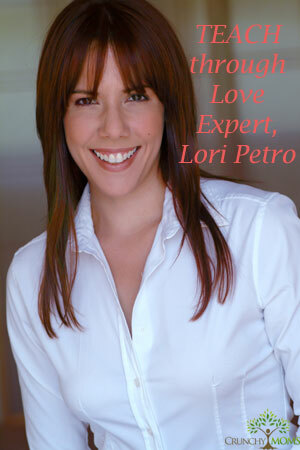 Lori Petro, Founder of TEACH through Love (teach-through-love.com) is a communications expert who teaches parents how to create peaceful relationships with their children through her TEACHable Moments Episodes, speaking engagements, workshops, classes, and coaching. She has a degree in education and is known for her ability to leave parents feeling empowered. Lori was diagnosed with Asperger’s as an adult *(see a correction at bottom), and is passionate about helping parents understand children with all sorts of unique needs. I was excited to interview Lori. She is a wealth of information, and I’m so pleased to be able to share some of her insight. Rose: How do you feel about the attachment parenting movement? Lori: I like to be very inclusive. I fully embrace attachment parenting and many types of parenting, if it involves doing the best for the parent and child. I didn’t even know about attachment parenting until my daughter was older, I was just naturally drawn to home birth, extended breastfeeding, and co-sleeping. I feel the attachment movement is important, but I’m not sure if I’m qualified to talk about it because I’m into anything that helps form bonds with children at all ages. Attachment parenting is the start of that: Giving people that foundation is amazing. That’s why I don’t focus on the baby and infant aspect. What I teach is where attachment ideas taper off. It’s a natural extension to attachment parenting. That’s most of my parents… They usually don’t find me until later. The “idea” of attachment is what I like: The idea of a bond, nurturing that bond through the long-term and nurturing the child beyond the baby years. Babies grow up. Kids test limits… Even attached kids! My method helps you see your kid as a person. I help you relate to your child with your intuition. Rose: Do you consider yourself a crunchy mom? Lori: I’m totally crunchy but never knew it. I was raised in a very mainstream environment. We had “Tide and Tang.” We can label people, but I don’t really like to be labeled, because it makes it sound exclusive. I want to be inclusive. That’s why I don’t really use labels for what I do. My sister is the exact opposite. She’s a Nurse Practitioner. She couldn’t be less like me (laughing). I like the idea of Crunchy or AP but the media likes to focus on mommy wars and dividing people. I want to unite people. I never experienced anyone giving me trouble for my choices like the media would allow us to believe. No one ever shamed me for breastfeeding, and I would never shame anyone for bottle feeding. I don’t know where it comes from because I don’t experience it. If you don’t go around expecting criticism, you just stay off people’s judgment radars. I just like to talk about relationships. I don’t want to tell you how to parent your children. That’s so individualized. If we can keep to the connection and restoring connection… that’s what attachment parenting is to me. That’s what is lost in our medicalization of birth and our fast food and our academics. We need to restore connections because that’s what’s missing. Rose: Do you think people can love a child too much, or spoil them? Lori: We tend to interrupt relationships. Spoiling is a judgment word. It can come out in a child who is unable to regulate their emotions. We can interrupt our child’s ability to flourish with overindulgence in things and not being the leader, but never with love or attention. Parents need to be leaders in terms of guidance and in terms of keeping (kids) safe. For example: A child who always has their food brought to them, but never has to help slice their own apple never has a chance. We have to allow development. Sometimes parents use things or attention and love as tokens. We have this idea that we take love and comfort from people as a punishment. I’m working on a documentary promo right now, and the kids say “All they do is punish me. Nobody listens to me.” This stuff is coming from kids as young as seven years old! I don’t do punitive discipline. Removing a child from a situation for safety, or sitting with a child to regroup is one thing, but fear-based punishment is not sustainable. I’m big on sustainability because that’s what’s going to change the way children are raised in the future generations. We’re in this model that is not sustainable. We have addicts; we have kids attached to video games, and they break down families. I want us to start looking in the mirror. Rose: What’s the most common question people ask you? If you would like to learn more about Lori’s TEACH through Love program, or book her for a presentation, please visit www.teach-through-love.com. *She has not received a formal diagnosis of Asperger’s.